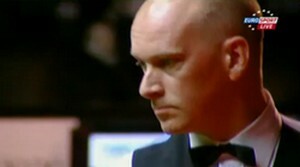 The first one we have is Peter Ebdon. 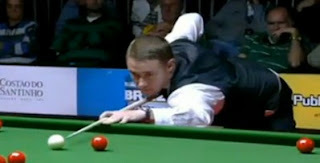 Ebdon ended Selby's run in Brazil by 4-3. The two players did not play that well at the beginning, especially Selby did not show what type of snooker he had played in Shanghai last week. Selby came back from 1-3 behind again to force a decider but this time he did not win it. Selby was 41-3 up in the decider but Ebdon caught a mistake to make break of 70 to edge out Selby. Second quarter-finals was set between Graeme Dott and Igor Fugueiredo. Fugueiredo beaten Jamie Cope in the previous round which boosted his confidence. Fugueiredo held a 2-1 lead over Dott but Dott came from behind to win 4-2 with 79 and 77. The Scotsman will face Ebdon in the semi-finals. In the lower quarter of draw, Shaun Murphy defeated Ricky Walden 4-1. Murphy took the scrappy first frame with 32 and 35 before Walden levelled 1-1 with 73. Murphy won the following three frames with runs of 67, 54, 47 to lock his place in semi-finals.